Friday, September 21st, was not your typical Friday at High School East. 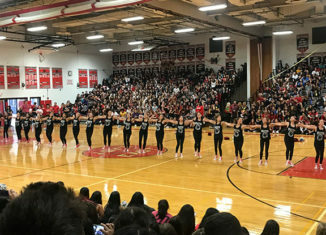 To end off the fun-filled Disney spirit week, students attended the annual fall pep rally. The student body came together with energy and Thunderbird pride. As students entered the West Gym, the Thunderbird band was playing, and each grade decorated their section of the gym based on their theme. The freshman theme was Spiderman, the sophomore theme was Toy Story, the junior theme was Cars, and the senior theme was The Incredibles. With Mr. Goldman as the MC, pep rally was bound to be a fun, energetic event. The cheerleading team was the first to perform. Their performance ended with some unbelievable stunts and gymnastics flips. Following their performance, the competitions began with the scooter race. It was a close finish between the teachers and the seniors, but the teachers secured the win. Everyone enjoyed seeing the teachers stepped out of their traditional roles to participate with their students. Then the first group of fall sports teams was announced. The players walked with pride with their team in front of the entire student body as they posed for a photo with the Thunderbird mascot. The egg race was next. Classmates cheered each other on, and the spirit was overwhelming. Shortly after this exciting race, the legendary High School East Step Team, coached by Mrs. Brown, performed. Once again, they did not disappoint and had the crowd going wild. Following the performance, more teams were announced. And then it was time for…the dizzy bat race. This hilarious event grasped the attention of everyone, from students to teachers. We give a lot of credit to all of the participants. It was a competitive race to the finish, but the sophomores took first place. The final announcement of teams was made after the dizzy bat race. All attendees of the pep rally got super excited when the T-Bird Varsity Football team was announced. Our proud student body didn’t hesitate to cheer on each and every member as they took their spot on the gym floor. Next up was our final performing team: the Hills East Dixettes. Coached by Mrs. Martinez, this team wowed everyone with their high kicks and epic dance moves. They offered us just another example of the immense amount of talent that walks our hallowed halls every day! One of the most honored traditions at High School East is the presentation of the Homecoming Court. With the theme this year being Disney, the court definitely did not disappoint. The skits included Jack Lippman and Paige Elberg as Tiger and Winnie the Pooh; Liz Von Brook, Matt Rubenfeld, and Danny Connell as characters from Lilo and Stitch; Ava Alicanti and Alec Schmigelski as Tinkerbell and Peter Pan; Sam Rochlin and Angelina Fermoselle as Mickey and Minnie Mouse; and Sophia Tawil, Tyler Henschel, and Dylan Dubler with the theme of Kim Possible. The skits were extremely entertaining. It is always so much fun to see how creative the seniors can be with their theme. The fun-filled pep rally concluded with the tug-o-war. Each grade was able to compete against the others. Not only was it fun to watch, but the participants also looked like they had the best time! All of the students seemed to love watching the teachers participate in this event as well. Watching the students and teachers compete against each other is always a highlight. A number of student government members, teachers, and administrators worked extremely hard to make this year’s pep rally the best one yet. Through the reaction of the students, it is clear that each and every person at High School East had an amazing time. Seeing students and faculty show their High School East spirit made for an energetic and excitement-filled afternoon.